It’s no secret that the first week Australian Fire & First Aid moved to their new premises in early 2011, Mrs P almost burned down the kitchen. To be fair it wasn’t her fault, a brand new recently installed electric hotplate had a short in the wiring. The resulting large bang (now referred to as the explosion for the sake of a good story), the smoke and sparks sent Mrs P running to the storage area for one of the many extinguishers we keep on hand here at AFFA. We were lucky that not only did we have the right equipment on hand for an electrical fire but that Mrs P was able to identify the fire type, select the right extinguisher and correctly use it to put out the fire. We were also extremely lucky that the cause was not a grease fire, the most common type of fire to occur in kitchens as we had not yet installed our fire blanket – it lay virtually useless on the bottom shelf of the pantry. How many of you have done the right thing and bought yourself a fire blanket to keep in the kitchen, garage, workshop or workplace? Great quite a few if recent sales statistics are to be believed. Now hands up those of you have actually INSTALLED your fire blanket? Yes install it, that’s right you need to do more with these babies than just bring them home and chuck them on a shelf somewhere. First select a piece of wall in or near the area you wish to install the blanket. Ensure you have room to move around the blanket, 1 metre square is preferable. Check the area where you would like to install the blanket to ensure there are no obstacles at ground level such as stored items or rubbish bins that you may trip over during an emergency. Make sure there is a direct clear path to the most likely source of fire from the spot of installation. Never install the blanket on the back of a door, one emergency at a time is enough to deal with, we don’t want you getting squished behind any doors. Ideally the best height is chest height of the person who uses the area most; in the case of a shared use area it is best to err on the too high side. The blanket needs to be high enough for the warden/responder to pull down firmly on the tabs to release the blanket from its housing. The lower part of the tabs should be between chin and chest height for the majority of users for the area of installation. Blanket is not secure and comes off wall when tabs are pulled – to avoid this try locating a support beam within the wall, at the correct height to fix the screws into or use wall mates or wall plugs to help fix the screws into the wall more securely. When I pull the blanket isn’t released – the blanket is most likely too low. Securing the blanket at a greater height allows you to use more inertia and more of your arm and shoulder muscles to pull down quickly and firmly to release the blanket. How often do we lull ourselves into a false sense of security by just making the purchase? You see what we did was about as useful as buying Norton Anti Virus for your computer and never installing it. If you have a fire blanket, first aid kit, extinguisher or smoke alarm in your house or business, take 5 minutes right now to make sure it is correctly installed or stored. Don’t wait until there is an emergency to find out if your safety products are useful. 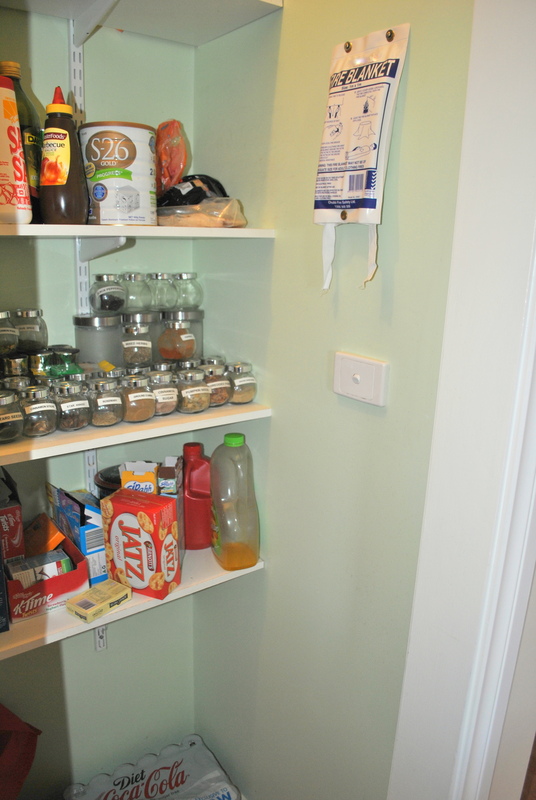 This picture is of Mrs P’s installed fire blanket in the pantry at home. It is installed quite high as all the residents in this house are tall. If you found this post useful your may want to check back in the near future for similar posts. Coming soon: Money down the sink – How to properly store your first aid kit, Shouldering the weight – Are your extinguishers correctly installed or are you a shoulder injury waiting to happen?